Since when do farms start expanding within Denver? When they are brewery tank farms of course. 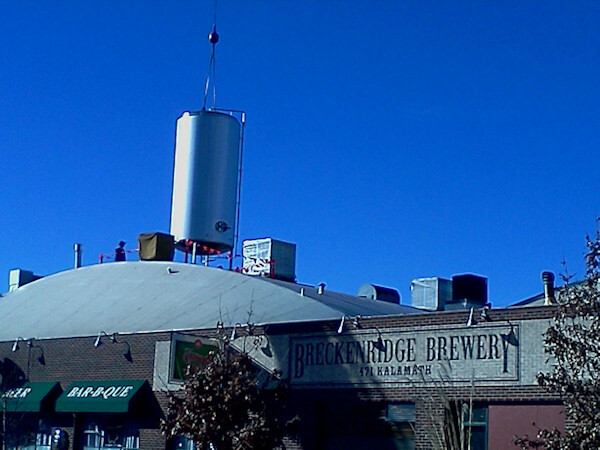 And this week, Breckenridge Brewery of Denver installed several new fermenters and brite tanks that will greatly boost the amount of beer they can make and store at one time. 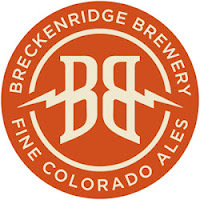 As part of phase 1 of their 2012 expansion, Breckenridge Brewery installed two 300-barrel fermenters yesterday and one 200-barrel Brite tank today. (See photos below). 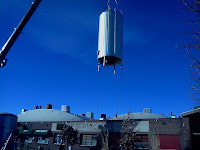 And four more 300-barrel fermenters are coming in March 2012. All three new tanks were made by Paul Mueller Company in Springfield, Missouri. 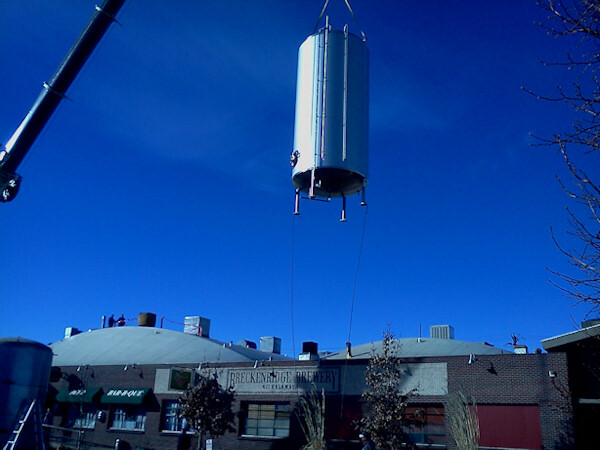 Each of the 2 fermenters installed yesterday is about 40 feet tall, 10 feet in diameter, and weighs about 10,000 pounds. The four scheduled to come at the end of March should be on-line and in production in early April. They've built a new room on the south side of the brewery at 471 Kalamath Street, Denver, to accommodate the six new fermenters. Today they installed the 200-barrel Brite tank into their filtration/packaging area. 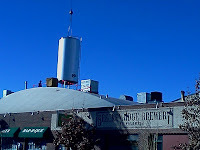 They had to lift one of the existing 100-barrel Brite tanks from this area through a hole in roof in the middle of the building in order to properly place the new Brite tank, again through the roof. They're moving the 100-barrel tank into another space in the packaging area. This expansion, like many others going on right now at craft breweries across the US, is representative of the marvelous growth of the craft beer market. Cheers to good beer! For Colorado craft beer info, go to Colorado Brewers Guild, http://coloradobeer.org/. Their Avalanche Ale was voted 2011 Best Amber in a Can by the readers of craftcans.com! Pandora's Bock, their spring seasonal, is available now. Small Batch Series is beginning to ship in 4-packs (formerly 6-packs). Available now in 4-packs is 471 IPA and 72 Imperial. 72 Imperial is their Small Batch "Occasional" beer that is a double chocolate stout made with milk and dark chocolate from Colorado's own Rocky Mountain Chocolate Factory in Durango, CO.
- Breckenridge introduces 4-packs in its Small Batch Series.